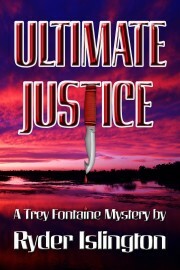 Please welcome Louisiana author, Ryder Islington, who’s novel Ultimate Justice, A Trey Fontaine Mystery was recently published by LL-Publications. Ryder shares her circuitous journey to finding the right publisher for her mystery series and some of the advantages of going with a small press. Ultimate Justice is available in print and ebook through LL-Publications and through Kindle and most major ebook retailers. You can find out more about Ryder at her blog. I had this masterpiece, my baby, ready to send into the world. At the Written In The Stars Conference in Shreveport, LA, a pitch to a big time editor won me a request for a full manuscript! She raved about the concept and the characters, so I didn’t blink when she asked for an exclusive. She kept the script eighteen months before sending a nicely written rejection, saying the writing was great, but she didn’t think the pace was fast enough nor was it a thriller, which was what she expected. I thought she knew it was a mystery, but apparently I wasn’t clear in my pitch. I sent out queries to agents and editors and got a few requests for a synopsis and a few chapters, but no one said yes. So I put the script under the bed, where it set for several months before I pulled it back out for more revisions. I started scouting the Internet for other options. After some research, I chose an e-publisher and sent a query. The editor contacted me for a full, kept it for three months and then sent a cryptic message regarding drastic changes in the number of characters and more showing and less telling. I asked for more specific advice so I could comply, but never got a response. Back to the drawing board. Three more queries. Three responses. One person asked for a full, but didn’t have time to read it until after the end of the year (I think this was about June or July), one said he would be glad to publish it, after only reading my query and synopsis. My ego yelled, “Yes!” but my gut said something wasn’t right. He couldn’t possibly be a legit publisher interested in putting out good books. And then there was the third one. I received a professional style letter requesting a full, and saying she would get back to me within six weeks. And she did. She explained what needed more work, and what she would require in terms of changes, and offered a contract if I agreed. She kept her word and I really liked that she said right up front what she expected and what I would receive in the way of royalties for my work. So I signed on the dotted line. I never got an agent. I don’t need one right now. The people at LL-Publications are very helpful, knowledgeable, patient, and willing to help make the end product shine. And so my debut novel, Justice, A Trey Fontaine Mystery, was born. I don’t regret my decision to go with a small press. I have to do a lot of promotion, but the truth is, large publishers don’t spend dollars on newbies. So even if I had landed one of the biggies, I’d be in the same boat. I feel empowered by working closely with the small press publisher. My book is available as an e-book and print on demand (POD). I like the greenness of that. And I like that I have no one pressuring me to put out more books, faster. I work as fast as I can, and I promote as much as I can. The editor understands that I have limited time, as well as physical limitations, and works with me, even sending business cards and cover plates for advertising. I think she’s pretty cool. The cover plates are pictures of the book cover, a bit larger than a post card, with a blurb, bio, review and a buy link on the back. I carry both of these items where ever I go and I’m not shy about asking, “Are you a reader?” The cashier, bank teller (I sold her three copies), physical therapist, movie ticket taker. Business cards fit nicely with my out-going mail. So, everyone at the pharmacy, electric company, and satellite provider gets an opportunity to learn about my book. I also post cover plates and business card in libraries, on bulletin boards, and I’ve been known to leave them lying around at the doctor’s office, the hospital, the massage therapist’s waiting room—no one is safe from my littering. So what’s next? Well, I’m working on book two of the Trey Fontaine Mysteries, while I work on the next horror of it all: promotions—Facebook and Twitter and blog tours, oh my! Time, time, time. My biggest sin is time—I have treated it with callous disregard. Let me tell you how. I wrote my children’s Christmas story, The Gift Giver, years ago, maybe three. And before that, it had been in my head for about a decade. So that’s 13 years I had to come up with a marketing plan for The Gift Giver. Thirteen years to secure media time, schedule appearances, do a real build up to Black Friday (when most people start their Christmas shopping). But, I didn’t do any of those things. In my defense, it’s been a hell of a year. So, it didn’t appear like the optimal year to release a book, especially when you factor in the fact that I’d never self-published a book before. But I’m nothing if not optimistic. I came back from my honeymoon at the end of October bound and determined to have this children’s book out by Thanksgiving weekend. Yes, looking back that may have been a little too ambitious. Doing all the illustrations myself and rewriting the manuscript about a dozen times, I finally had a draft I was proud of by the end of November. It then took me several days to figure out how to upload it to Amazon with all the formatting intact, all the while the number of shopping days until Christmas dwindling away—just like the song. (Is there a song for that? Well, there should be one.) Anyway, I did it. I got my book listed in all the major eReaders with a print version on Amazon.com. Whew! With only three weeks till Christmas, I’ve managed to squeeze myself into one writer’s fair to sell some books. It was a lot of fun and got me pumped up to really start plugging my book. This was when I realized there’s a lot more to publishing a book than just publishing a book. Somehow you’ve got to let people know it’s there and make them want to buy it. But how? I turned to my writing friends for help. Some interviewed me for their blogs, some had me write guest posts (like the one you’re reading now), and others suggested independent book stores in which to sell my stocking stuffer. But in the midst of all this pre-Christmas chaos, what I’m struggling with is time. I need time to visit these book stores, time to write blog posts, time to go to book fairs. If I as independent publishers am to be successful in my literary endeavors, I must allow myself time to plan, time to execute my plan and then time to follow up after the execution so I can keep sales soaring. I’m going to assume that this is part of the reason the big ships like Simon & Schuster and Harper Collins buy books so far in advance—to give themselves time to build a strategy. I, for one, will not commit the sin of taking time for granted again. Next year will be different. I’m going to start in the summer so by Thanksgiving I will have people lined up to buy my book. I may even create a special edition with more illustrations. In 2012, I will prioritize and give myself the gift of time. You can, too. Your book deserves it. It deserves your full attention and the entire weight of your creative brain. Let my story be a lesson to you and believe me when I say that your three biggest assets when marketing your book are time, time and time. The Gift Giver is available on Amazon, Nook, Kindle and Lulu for the iPad.